Los Angeles has a few good roast beef sandwiches. I'm particularly fond of the Rare Roast Beef at Clementine's and the French Dips at Phillipe The Original and Little Next Door. But that's about it. Truth be told: LA is not a roast beef city. Whether it be the health conscious city mantra or just a general lack of interest, the sandwich so beloved elsewhere has never really found solid footing in the Southland. Top Round Roast Beef, from a well-accomplished local restaurant quartet, hopes to forever change that. Top Round is a roast beef shop. And only a roast beef shop (and ice cream and homemade curly fries). High quality roast beef at non-high quality prices. Almost like Arby's... but good. No LA multi-faceted menu here looking to appease all denizens. You come to Top Round, you're getting roast beef, so leave your calorie apps in the car. Hell, the curly fries are fried in beef fat and even the mushrooms are cooked in the stuff. Opened Monday at the grub-desolate corner of La Brea and Olympic, it was no surprise the very affordable fast casual spot was already buzzing on Day 2 as I accepted a gracious invite to sample Top Round's fare. Sitting next to me? Two cops - which is always a very encouraging sign. THE SPACE/RESTAURANT: Top Round is located in the former Bee's Donuts spot, tucked into the busy corner of La Brea and Olympic. Patrons can order and sit either on the front patio or the slightly smaller inside space. In a nice twist, unlike many recent local restaurant openings, Top Round strays away from the ever-popular exposed beams and recycled woods motif, instead going for a very cool, retro Southern California fast food vibe. Rightfully so, I would say. Covered in bright orange, red and white, it's sort of like a trip back to "American Graffiti." The prices aren't too far off either - the most expensive sandwich on the menu clocks in at a mere $6.45. As I sat there awaiting my food on the expansive covered patio on a beautiful LA June afternoon, I imagined the owners hoped to transport customers to a simpler time... with more complex roast beef sandwiches. Well, mission accomplished. THE FRIES: Like the roast beef and pretty much everything else on the menu at Top Round, they make their own curly fries. I repeat, THEY. MAKE. THEIR. OWN. CURLY. FRIES. Tell me anywhere else in LA that does that. Please stop trying to think of a place. It doesn't exist. I know because I'm chubby and eaten way too many French fries in my day. Anyway... the Top Round curly fries are thin-ish, almost like shoestring fries, but with just enough heft to them. I would say definitely order them, if I didn't think you absolutely need to order the Dirty Fries instead. Not for the faint of heart, the Dirty Fries come with a curly fry base, topped with gravy, Provel cheese, caramelized onions and "Round sauce." So that's a beef-based gravy, onions cooked in beef fat and the house beef fat brown sauce. And Provel cheese, which is a mild and buttery St. Louis-area Swiss-cheddar-smoked provolone hybrid. Despite the recent explosion of poutine on finer restaurant menus in the area, I can't imagine a better fries and topping combination. Especially for the price ($3.95). ROAST BEEF: Based on favorite roast beef sandwiches from the midwest (and even a little New England/upstate New York influence), the Top Round menu is simple: six roast beef sandwiches, all with the same in house 12 hour-roasted top round beef with a little au jus and "seasoning shake," and varying toppings. Three bun types on offer: caraway & sea salt, onion and seasame. Although the bun origins remain a secret, I was informed they are from the same place as In 'n Out. Every sandwich can be accompanied for an extra dollar with homemade wizz (which I tried and can proudly state does, in fact, taste like the real wizz, so, uhh, stop fretting) and/or Provel. I sampled three of the six sandwiches: Beef on Wick (roast beef and "atomic horseradish" on caraway & sea salt bun), Horse & Hole (Provel cheese, horseradish cream and roasted mushrooms on sesame bun) and the Bar-B-Cue (fried onion & jalapeno straws and bar-b-cue sauce on an onion bun). 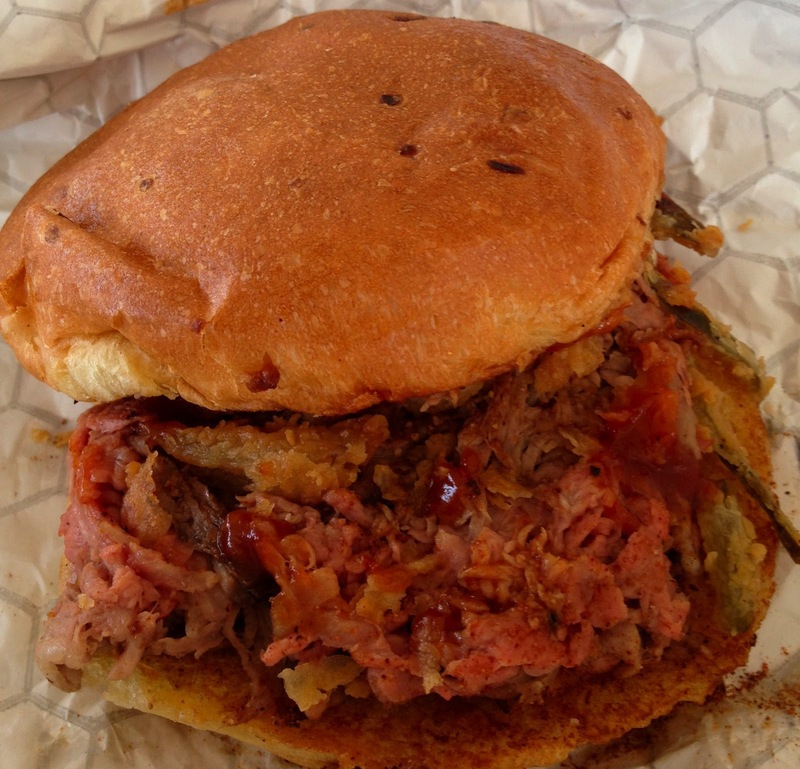 The distinct salty bun taste of the Beef on Wick fondly reminded me of my late night, inebriated collegiate visits to many of Boston's roast beef shacks. 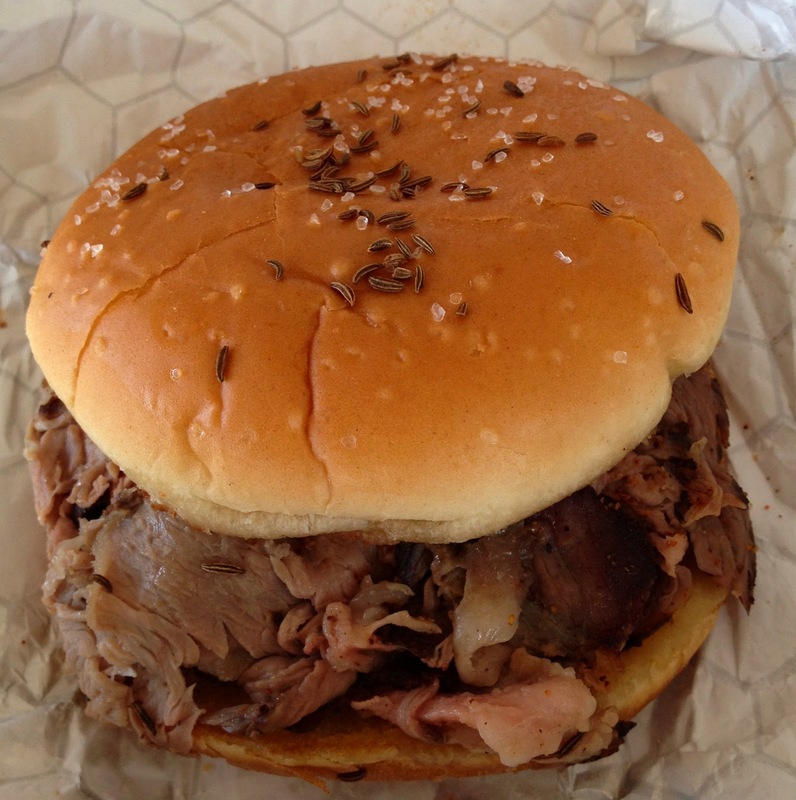 The roast beef itself, as it is on all on the sandwiches, was well cooked and seasoned. My fears of low prices equaling small servings were also alleviated. Each sandwich is plenty hearty. As for the "atomic"-ness of the sauce? Pretty manageable for a horseradish sauce lover like myself. The Horse & Hole tasted very much like an Arby's sandwich - except much better. The mushrooms in particular provided a nice touch. Surprisingly however, my favorite was definitely the Bar-B-Cue. While many bbq roast beef sandwiches are drowning in sauce, Top Round doesn't overwhelm the sandwich with sauce and rather lets the roast beef and onion and jalapeno straws do most of the work. Overall, it's a very tasty flavor combination. At $5.45, I can't think of too many LA sandwiches better for the money. ICE CREAM: If curly fries and roast beef sandwiches aren't enough to fill you, Top Round also offers an array of 14% milk fat custard-based dessert items. Shakes, malts, sundaes and the beloved, Concretes. For the uninitiated, Concretes are basically Dairy Queen Blizzards - a tightly packed custard shake with some toppings mixed in for good measure. They earn their name because you are supposed to be able to turn them upside down and they won't move. You can order off a menu of preexisting combinations or choose from their extensive toppings bar and make your own. Although I stupidly forgot to test out the concreteness of these Concretes, I can't complain about Top Round's Cookies N' Cream or my vanilla wafer-caramel-streusel concoction. They both were both tasty and ideal for a hot summer afternoon. They also have TWO Coke Freestyle machines for soft drink consumption. This is the first place I've seen to possess two of the pricey dispensers and should come in handy as they get busier. IN CONCLUSION: Overall, I really enjoyed my first Top Round Roast Beef experience. For the money, it immediately becomes one of LA's top value sandwich destinations. Especially for its La Brea and Olympic location, which offers nary a competitor. 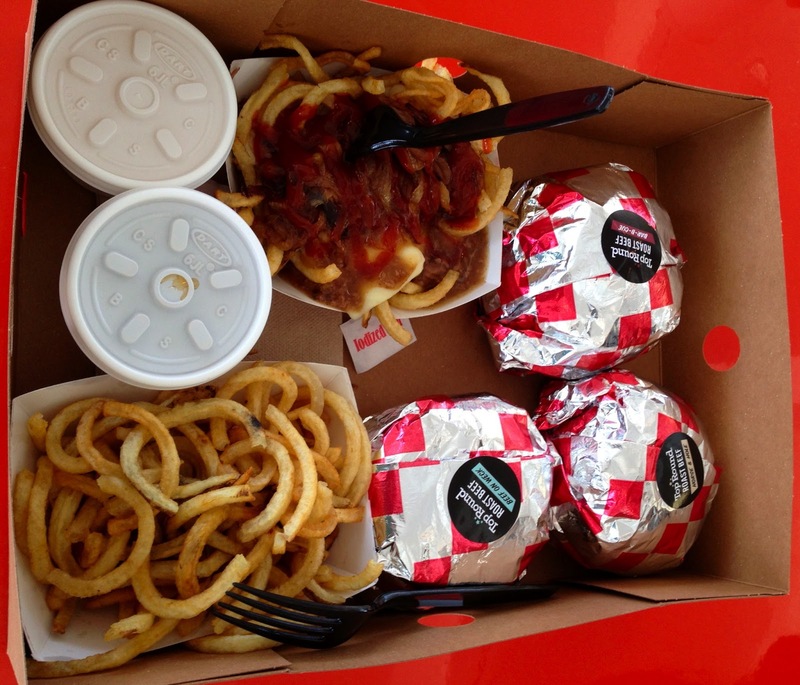 The roast beef and curly fries are solid. My only real complaint: it was NOT a light lunch. I see myself returning to Top Round, but probably more ideally for dinner or a late night snack. I feel like if I had a Dirty Fries and Bar-B-Cue combo on a work afternoon, I'd sleep the rest of the day. But that may just be me. I'm weak. Besides, me complaining that a spot offers a filling, delicious meal at a low pricepoint? That's not a complaint. That's a compliment. Open 11 am - 11 pm everyday. I'll test the concrete-ness of those shakes tomorrow and let you know! I had no problems using this service of Money off Argos. Great service, fast response and approvals. My experiences with Speedy delivery have always been great!